It was exactly 543 years ago today that the Battle of Barnet – one of the key battles of the Wars of the Roses – was fought near what was then the small town of Barnet but is now an area on Greater London’s outer northern fringe. King Edward IV, returning from exile in Burgundy after he was ousted by the Lancastrians, led an estimated 10,000 Yorkists in an engagement with some 15,000 Lancastrians (who backed King Henry VI) under the command of Richard Neville, 16th Earl of Warwick and known as the Kingmaker, who had previously supported the Yorkists (and before that the Lancastrians). The forces met on 14th April, 1471, at around dawn but thick fog sewed confusion in the Lancastrian ranks with allies attacking each other and the army eventually fell apart amid cries of treachery. Warwick was killed in the battle as he attempted to flee. The exact site of the battle remains something of an unknown although it is thought to span the community of Monken Hadley just to the north of Barnet itself (that is the area marked on the official English Heritage Register of Historic Battlefields). 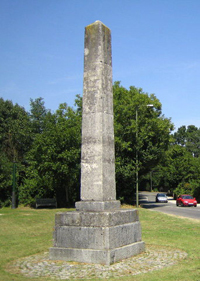 A stone monument to the battle, the Hadley Highstone, was erected in the 18th century and in the 1800s was moved to its current location at the junction of Kitts End Road with the Great North Road in Monken Hadley and was originally thought to have marked the spot on which Warwick died. The Battlefields Trust is currently developing a project to pin down the location further. The battle was important because, along with the following Battle of Tewkesbury during which the Lancastrian heir Edward was killed (and the murder of King Henry VI shortly after), it secured the throne for King Edward IV for the next 14 years.